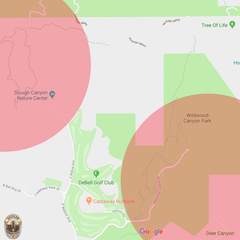 Wildwood Canyon and Stough Canyon recreation areas and hiking trails in the City of Burbank are CLOSED until at least Friday (12/7), due to heavy rainfall and the increased risk for debris/mud flow. Please avoid these areas. Trails will be assessed on Friday and re-opened when safe.